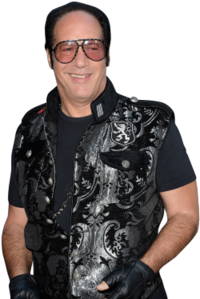 In the 1990s, stand-up comic Andrew “Dice” Clay was known for his iconic leather jacket, sunglasses, and propensity for dirty nursery rhymes that began with “Hickory dickory dock.” Times have changed. After taking multiple steps away from show business, Clay is ditching the Dice and becoming a dramatic actor. He disappears into his standout, sympathetic role in Woody Allen’s Blue Jasmine, after playing himself on the final season of Entourage. We spoke to Clay, whose old-school self can still be heard on his podcast "Rollin’ With Dice And Wheels" and on his latest Showtime special Indestructible, about auditioning for Allen, blue-collar America, and why he wouldn't call this role a "comeback." Your act as “Dice” was so iconic. What expectations do you feel people have when they see you around these days? I surprise a lot of people. When we talk about Dice as my stage persona, I owe it to my fans and myself to lock in to that person. Because that’s how I present stand-up. So there’s no bending. That’s who I am. When I’m that guy, I’m that guy. And that’s it. When I was filming the movie I wasn’t thinking about any of that. It was really about, as an actor, playing the role exactly the way Woody would want it played. Back then, a year ago, I wasn’t thinking, Well, what’s the press gonna think of this? I was just thinking, I gotta do scenes with Alec [Baldwin] and Cate [Blanchett] and Sally [Hawkins], and I just better be on my A-game, or they’re gonna just make me look stupid on film, and I’m gonna wind up on the cutting room floor. So it was more just about surviving the part. I read that Woody Allen saw you on Entourage and immediately thought of you for this role. When he saw me on Entourage, he thought, Where’s he been? And because of him, now I’m everywhere. He didn’t really give me much to go on, when I met with him. He just wanted me to read a couple pages. But even after I read, the way he told me, how I read, I just understood it. I had the essence of it, and that it was perfect. I have an East Coast dialect — I mean, yeah I could play different parts, but I stick to what I am. Different shades of my personality, I’ll put it to you that way. I read something about how Woody was talking to you about stand-up, about getting back into it. Did he ask you for any specific advice? No, and he wouldn’t either. He’s such a genius in what he does, he knows himself so well as everything from stand-up to producer, director, writer, star. I mean, if he goes back into stand-up, he knows exactly what he’s doing. One of the movie’s themes is that wealth shelters you from dealing with reality. How has your own past success impacted the way you view the world? Well, there’s a lot of wealthy people out there that just look at the blue-collar world like they’re insects. It’s just the mentality, and I’ve never liked it. And I’ve lived on both sides of the coin. I’ve been broke, I’ve had a lot of money, but I come from hard-working people. I come from blue-collar Brooklyn. You know, not getting everything you always want, when you want it, and being taught you gotta go out and work for what you want in this world. Whether you just want to make a lot of money doing something, or if you have some kind of dream, or something you want to accomplish. It’s up to the individual. I wasn’t born with a silver spoon in my mouth. So I’ve seen both sides of that coin, a few times. Do you have a different perspective for this particular comeback? Anyone I talk to I say it’s more of a resurgence. There’s a difference. A comeback — let’s say all these years I’ve really been trying, this would be a comeback. But the fact is, I sort of backed away from making any kind of career moves around 2000, when my marriage got really tough, and it was really more about raising my sons, when I moved out, when me and my wife broke up. So I always worked, as far as a comic. I would play the club scene, and make ends meet, and come home and take care of my boys. But there was absolutely no career moves being made. And then when they were old enough, it was like, Okay, I’m going to give this a shot again. I’m going to blow myself up again and start thinking how, and strategizing, and even with the gigs I would do, strategizing where I would go, when I would go, what it might lead to. I was always thinking three, four steps, five steps ahead of the game. Well, it was more about getting my name out there a little bit, and when the opportunity of The Apprentice came up, which, they wanted me a day before they were filming this thing — I was probably the last name on that list, and they needed somebody. So I took the shot, because I realized millions of people watch the show, millions of people are gonna see me. So I’m going to get to be funny on this thing, and just reacquaint myself with the American public. So that was one of the first moves. And then, once I got my feet wet that way, it was about what’s the next move, and all of a sudden my manager comes walking into my life, Bruce Rubenstein. And within a day, we’re meeting with Doug Ellin about the last season of Entourage. And Doug really knew that the way he would write this would put me out there in a big way. And even as I was doing Entourage, I was thinking, Okay, we need to do another comedy special, I need to do another special. So that took place, and while that was all taking place is when I got the call from Woody. And that was about a three-year process, all of that. And here we are. There was no way I was ending my story that way, when I was down and out. It’s like the line Rocky Balboa he says to his own son in the movie, that life will beat you into the ground and keep you there if you let it. And I’m just one of those guys that I don’t let it.